Quite a few people on GoAnimate have asked me to make a Koolmoves tutorial for creating flash props and characters suitable for use with the GoAnimate Studio. Well that day is finally here with this series of four videos that will give you more than enough learning to at least be making your own flash props - and will give you a kick start for animating characters too. The first video will step you through the process of setting up a template file suitable for using as a starting point for all your flash props and backgrounds. More than that, the way the template is set up is exactly how you need it for creating your own GoAnimate Community Characters - a feature that is currently only available to GoAnimate Beta Users but, if GoAnimate makes it widely available, you'll be ready. The tutorial finishes with showing how to upload your flash props/backgrounds/characters etc. into the GoAnimate Studio. In part 1 I show you how to import a trace image into Koolmoves (meaning you don't need to be a great artist to make your own stuff - you can just trace from photos or other peoples art). I demonstrate a particular bug Koolmoves has when it comes to tracing images. Fortunately it's just annoying and not a fatal bug. Then, before we start I run you through the main drawing tools and demonstrate why you should never ever use the freehand line or freehand shape tool. Finally I show you how you can add a 'styled' line into your art if your the kind of person that likes a more varied thickness of line in your drawing. Part 2 I talk about character planning. i.e. creating your character in sections for easier animating later on. 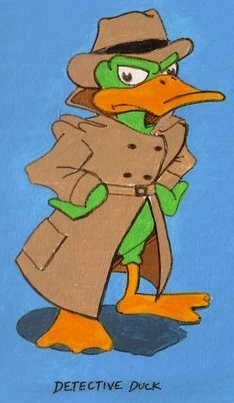 Next I step you through drawing just one section of my character, Detective Duck and show you how to group all its parts together. In the final part I show you my finished Detective Duck character and pull him apart so you can see how I've group various sections of his body together. I then show you how to make your very first animated action, Breathing (yeah awesome, I know!). It may not sound exciting but making your character breathe is the difference between it being just a picture or an animated character. Through learning that simple action I introduce you to the concept of 'tweening' - any flash animator that tells you they hand draw every single frame of their animation is lying. These days it's all about the key frames! With that, you have more than enough to get you started with Koolmoves. If you're just making a still prop or background, make it inside your movie clip object with a single frame. Then resize it on the Main Movie stage and then import it. Note that backgrounds do not need to be centered like props and characters because they automatically fill the GoAnimate stage once imported. I will be doing more Koolmoves tutorials in the future. If you have a specific request for a tutorial let me know in the comments below. Making animations that don't continuously loop (action script). Animate your own Stick Figure Characters using Bones. Comment below if you have a preference for which of the above I should tackle first. In my tutorial about animating custom moves for GoAnimate stick figures I show you how to make animations that don't loop. It's actually very simple to learn. A while back I experimented with bones in Koolmoves and found them to be very buggy and not very useful (even the makers of Koolmoves admit their bone system isn't that great as yet). I'll have to try again to see if it would be worth doing a tutorial about them.